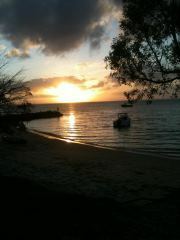 Like many Brisbane schoolchildren, I spent the bulk of my Christmas holidays on Stradbroke Island. For three weeks in January we would swim, get sunburnt, play Mortal Kombat on the arcade machines at the corner store, and try to talk our parents out of taking us on the dreaded gorge walk. They say you can never go back, so when I arranged to spend New Year's Eve on the island this year I was a little worried that everything would be different and the place would be ruined for me forever. But they also say that the more things change, the more they stay the same, and I was happy to see that this was the case here. There was even an arcade game at the store near our camp park. If you've been avoiding returning to Straddy for fear that the developers have ruined everything, I encourage you to return. I'll even tell you what's still good about it. 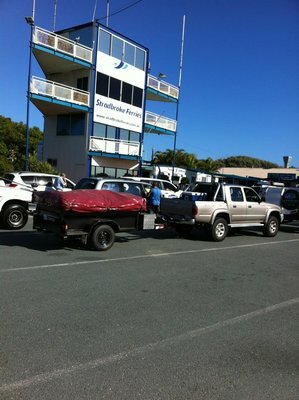 Nothing's changed here; you still have the choice of Stradbroke Ferries or the Big Red Cat. Both offer vehicle barges and walk-on ferries and both depart from the Cleveland terminal. The Big Red Cat is quicker and offers more trips, but Stradbroke Ferries is cheaper. The choice is yours. Sure you can rent a house or a holiday apartment, but Straddy holidays are more fun when you're constantly brushing sand out of your sleeping bag and showering in your thongs. Trust me. We stayed at Amity Point Camping Grounds, which offers tent sites and cabins. It's a more family friendly option, positioned as it is on a quieter section of the shoreline and boasting at least four different playgrounds. The dolphins, koalas, goannas and other wildlife that walk (or swim) right up and say hello are an added bonus. The less family friendly Adder Rock, in Point Lookout, is a better choice if you're there to party. Great food, cheap drinks and a laid back atmosphere makes a trip to the local bowls club a must do. Point Lookout Bowls Club and The Amity Point Community Club both offer a variety of traditional pub grub like steak, battered fish and schnitzel served with chips, and a selection of more gourmet offerings, like risotto and pasta. To wash it down with anything other than a cold beer would be completely un-Australian! 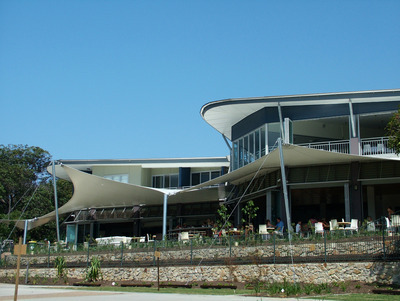 or, as it is now known, the Stradbroke Island Beach Hotel Spa Resort. Now, I was one of the dissenters who howled loudly when it was announced that the Straddie Pub was undergoing a renovation. Although the old pub is barely recognisable, I have to admit that that's not entirely a bad thing. The new establishment is a modern configuration of glass and steel but it's still the type of place that you can head to straight from the beach. And that view deserves to be enjoyed from real tables, not those cheap plastic outdoor sets. You can still have a drink, a meal or play a game of pool here, and you can also rent a holiday apartment or enjoy a massage or facial. Not such terrible additions after all. After you've finished paying to have mud slapped all over you, get muddy for free with a good bush bashing session. Some of Stradbroke's lakes, like Brown and Keyholes, are only accessible by four wheel drive tracks, and they make an enjoyable day trip. If you want to drive on the beach you will need a beach permit, which can be purchased from the ferry terminals and many stores on the island. A permit costs around $40 and is valid for one year. You can drive on Main and Flinders Beaches but only at certain times of the day. You should receive this information when you purchase your permit. While some things have changed, Stradbroke Island is still a laid back beach destination and a good choice if you want to escape the rat race, but still have mobile phone reception.